Chinese Crispy Seaweed is much less exotic than it sounds. While "seaweed" is in the title of the dish, it’s traditionally made from bok choy. 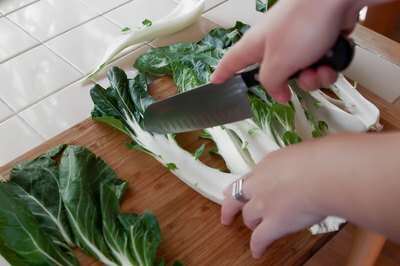 Cabbage or other greens make an equally delicious recipe. Rather than venturing to Asian markets, you can buy the ingredients at your local supermarket—and then wow your guests with the authentic recipe. 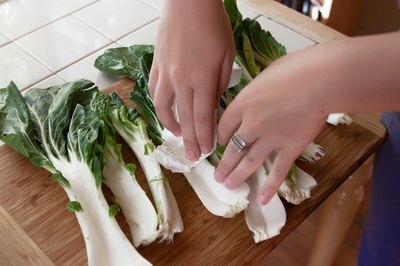 Clean the bok choy or other greens. 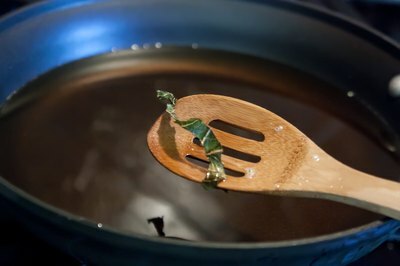 To ensure a crispy result, the greens must be completely dry before you fry them so wipe the greens with a damp paper towel rather than rinsing them in water. Cut the thick center stems from the greens and set them aside for use in another recipe. Lay the leaves on top of each other and roll them tightly together lengthwise. 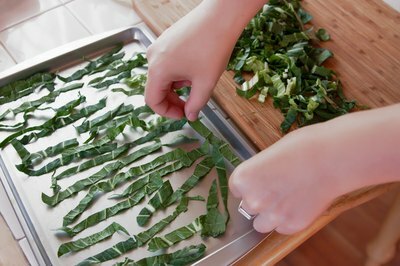 Shred the leaves into thin strips, cutting across the bundle with the knife. 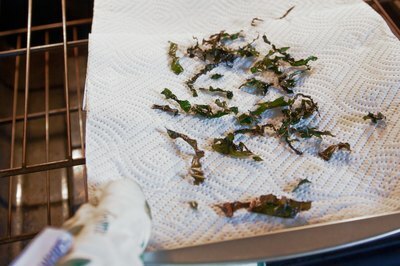 Dry the shredded greens by spreading them in a single layer on a tray. 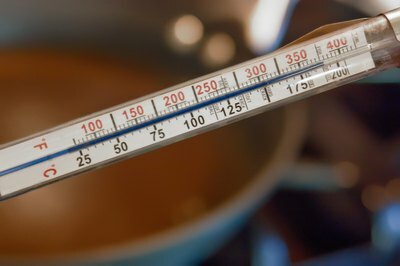 It might take an hour or two for them to dry out, though you can speed the process up by putting them in an oven set at about 150 degrees. They’re ready when they are dry to the touch. 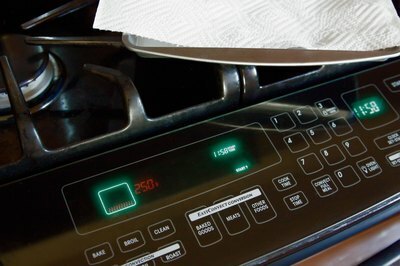 Preheat the oven to 250 degrees, and line two baking trays with paper towels. Heat 2 inches of oil in a deep pan or wok to 375 degrees. 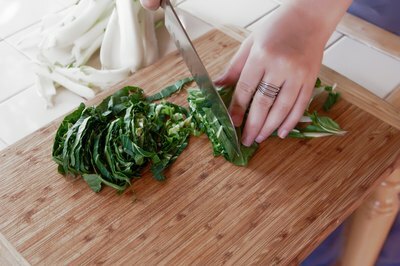 Add a small amount of shredded greens to the oil and deep fry until they turn deep green, about 45 seconds. Remove the greens with a slotted spoon and place them in a single layer on a paper towel-lined baking tray. Put the tray in the oven to keep the greens warm as you finish frying the rest of them. Toss the fried greens with salt and sugar to taste, garnish with dried fish or shallots, if you desire, and serve as an appetizer or as an accompaniment to a Chinese entree. The greens will stay crispy for about 30 minutes. If they lose their crispiness, simply warm them in a 300-degree oven. 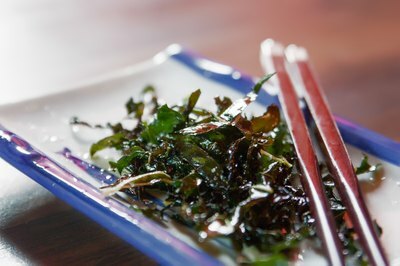 If you’re making a fried or stewed entree to go with the seaweed, add the stems from the greens to the entree. For an especially authentic flavor, deep-fry the greens in peanut oil. Add the greens to the oil carefully, as the oil could splatter, even if the greens are completely dry. Watch the greens constantly as you fry them. They can quickly turn from a delicious dark green to a burnt brown.